A fault tolerant and redundant production cloud suite that offers the lowest turn around time in the industry,implementable on-site with Tyrones service engineering experts. Tyrone Cloud suite helps organisations meet the modern day challenges and unique needs of a data centre. Our tailored-to-build approach while designing a cloud machine keeps sustainabiliity, customer’s IT information ﬂow and archi tecture in mind. We can implement and deploy your cloud machines on a variety of technologies. The Tyrone Cloud Suite machines build the cloud architecture from ground up with absolute ease. They also hand-hold any architectural changes with respect to the existing infrastructure that might require modiﬁcations, OS and technology upgrades, and deeper design revisions. Tyrone Cloud Suite is ﬂexible and can be tightly tuned to your unique needs. 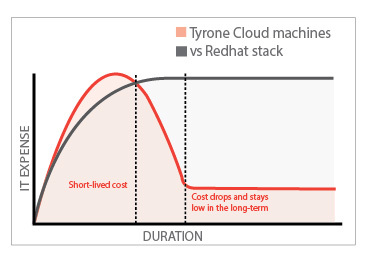 Cloud built with a cloud machine is signiﬁcantly reduced and stays low in the long run. The 5 Step journey towards Tyrone Performance Stack for Cloud Suite 7XXCL.